Gold embellishment on shoulders - seam/fold on shoulders? Is there a triangular shape on the shoulders, similar to the poster image? Can see a bit more of the dress here. The shoulder edges are edged with a brown and gold trim about 3/4 an inch wide. This trim is also just below bust level and has 3 more rows at hip level. Again, we don't see below the waist, and the exact nature of this garment is not known. It seems similar enough to all the other 'blue-gray' garments described here that they may be all the same thing. The 'Yellow Rock' photo has the best details visible of the blue-gray fabric, which is textured with threads of different sizes, is slubby and a bit shiny. Ties are visible above the elbow and appear to be made of the same fabric. 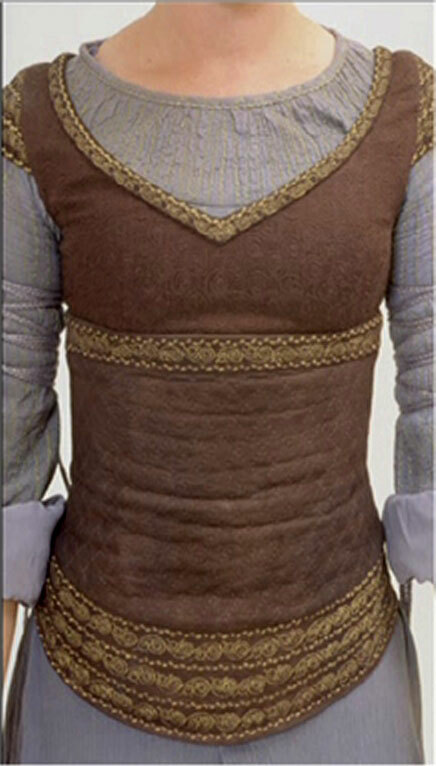 There is an image that is in the book for the Games Workshop game that shows another angle of this outfit. 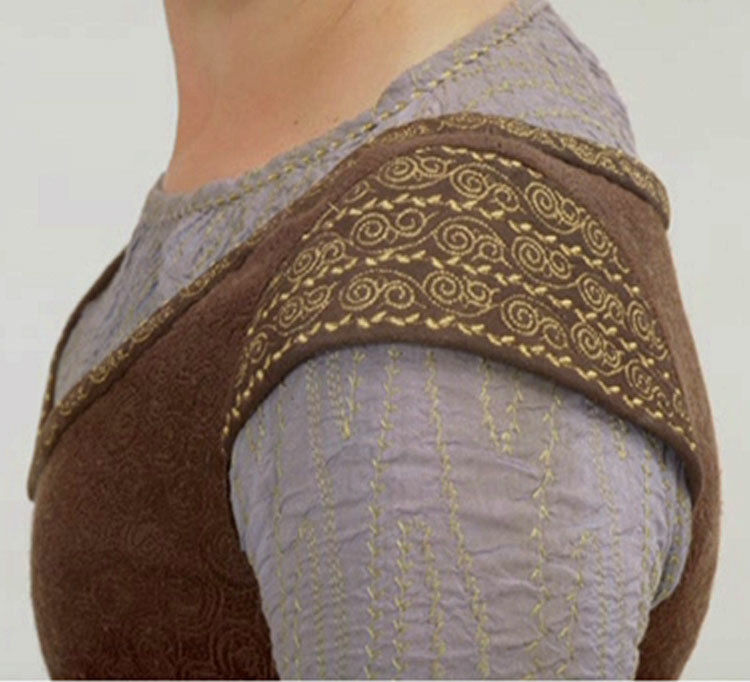 It shows more detail on the shoulders, and confirms that this is the same vest as worn with the cream chemise. In this image, it looks like a rough wool. 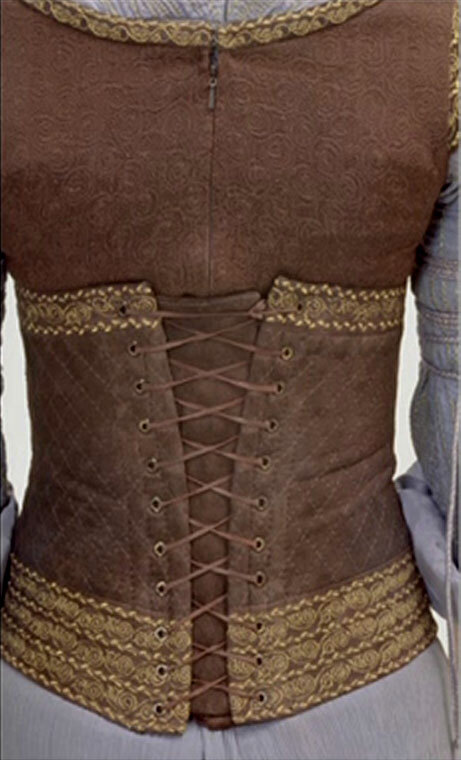 You can see three rows of trim that make the cap sleeves, and the trim on the neckline. It is a swirly gold design. The quilting on the vest appears only below the bust line. The stones are cabochon-shaped and look like lapis. The pendant is about 1" to 1 1/4" wide. 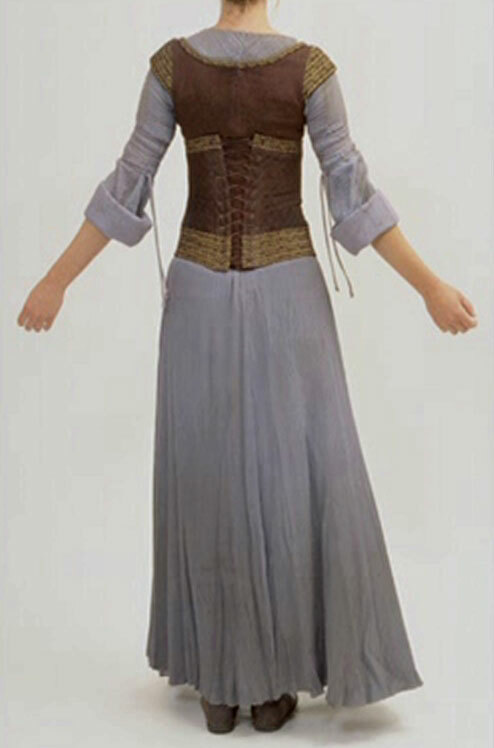 Eowyn is wearing a blue-gray top with scooped neck and fitted sleeves (rolled back at the wrist?) beneath a brown vest. Below the waist she wears more blue-gray fabric, in what looks to be a front-split skirt (or dress if connected to the blue-gray top) with trousers underneath. Impossible to tell what she is wearing underneath this, though she must be wearing something if this is a front-split skirt. Also too blurry to tell what she's wearing on her feet.